I am locked in a perpetual search for new main dish recipes. This weekend, I decided to take on Chicken Marsala from the America’s Test Kitchen Family Cookbook. There’s a lot of good stuff in that cookbook, and I’m a big fan of their work. I’m also a big fan of mushrooms stewed in wine, so it was a no-brainer. This recipe makes 4 servings. Here’s how it all went down. Start by pre-heating your oven to 300F. You’ll want to keep your chicken cutlets warm while you’re making the sauce. To prepare the chicken, slice each breast in half horizontally to make two thinner cutlets. If one end is thicker, pound the thick end to make chicken cutlet uniformly thin. Once the chicken is halved and pounded, season each cutlet with salt and pepper and dredge it in flour to coat. 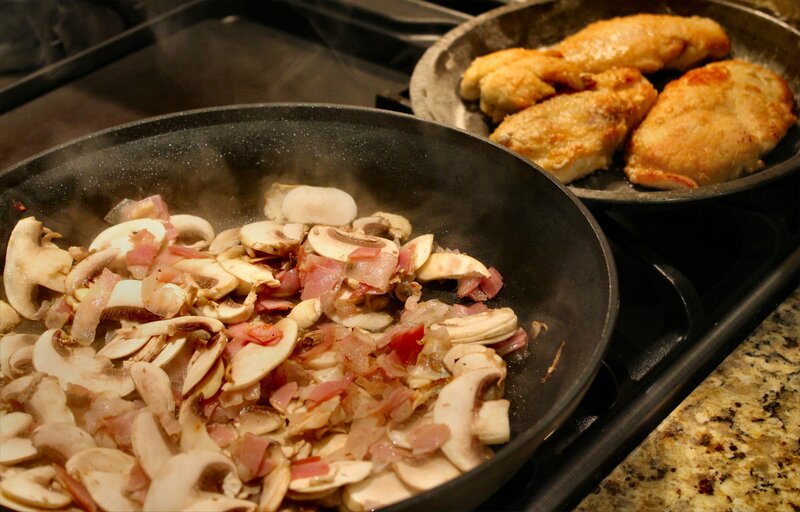 In a hot skillet over medium-high heat, add the vegetable oil and cook the chicken until golden brown on each side. Place the cooked cutlets in an oven-proof pan, cover lightly with foil and place them in the hot oven to stay warm. Using the same oil that is already in the skillet, cook the pancetta and sliced mushrooms until they are a deep, gorgeous brown and the pancetta is crispy. Note: I did not mince my pancetta, and I came to regret it. The larger pieces really distracted from the desired texture of the sauce. Don’t be like me. Mince your pancetta into tiny little tidbits. You’ll thank me for it later. 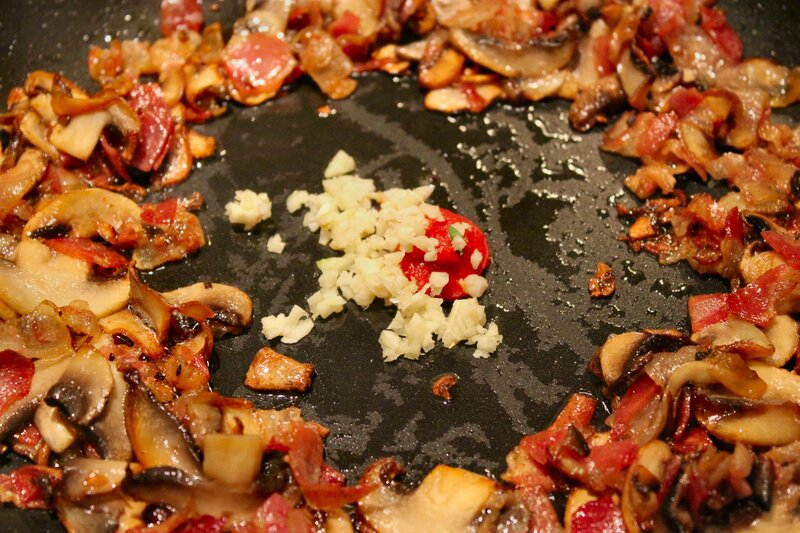 When the pancetta and mushrooms are a gorgeous golden brown, make a well in the center and throw in the garlic and tomato paste. Brown for a few seconds, or until you really start to smell the garlic. 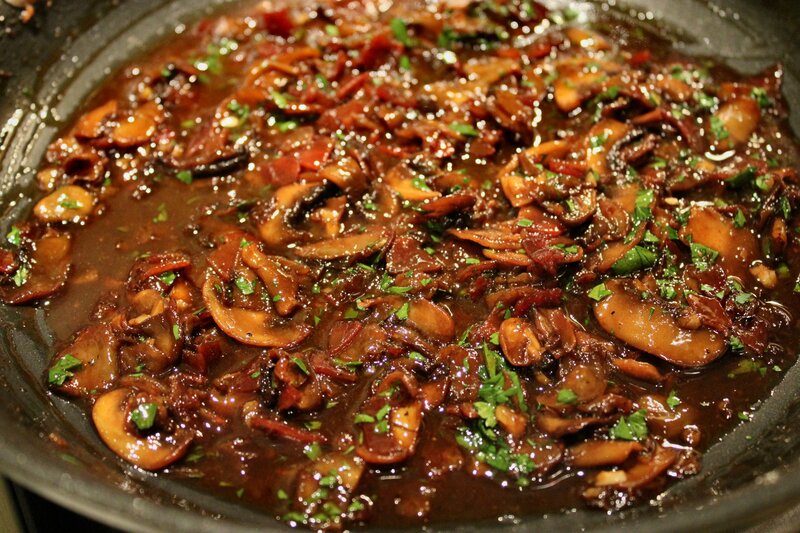 Stir together with the mushrooms and pancetta and add the Marsala wine (as soon as you read the following note). NOTE ON SWEET MARSALA VERSUS DRY MARSALA WINE: The ATK Cookbook clearly says to use sweet Marsala wine. The little Italian man at the liquor store said to use dry Marsala wine. I bought both, thinking I might blend the two. Instead, I convinced myself to use the sweet Marsala, as stated in the cookbook. Big mistake, in my opinion. The final sauce was… well, too sweet. Not at all like the savory Marsala sauce I order in restaurants. Next time, I’m sticking with the little Italian man and using the dry Marsala. As he so wisely stated, “You use the sweet Marsala for tiramisu; you use the dry for marsala in sauces for meat.” Lesson learned? Never argue with an authentic Italian when you’re making Italian food. That seems so clear to me now. Okay, so once you’ve decided to skip the sweet for the dry Marsala, pour the wine into the pan with the mushrooms. Keeping the heat at medium-high, allow the sauce to cook down until it is reduced by at least half and the wine takes on a syrupy texture. This will take a few minutes, so stir it occasionally and keep an eye on it. Once it’s reduced, add the lemon juice and stir to combine. Turn off the heat and add the cold butter, one piece at a time, whisking it in before adding the next piece. Add the minced parsley and stir it in; add salt and pepper to taste. Serve over the cooked pasta of your choice. I also recommend a nice salad and a warm, crusty baguette. And if you have a lovely bottle of Italian red on hand, well that’s just frosting on the cupcake. Final Thoughts: this recipe is worth making, with a few minor adjustments. I feel strongly that dry Marsala is the better choice here. And because I like the smooth texture of a Marsala sauce that really showcases the mushrooms, I think I will fry the pancetta and remove it from the pan next time so it will flavor the mushrooms, but not be incorporated in the final sauce. I’m looking forward to trying this again with the dry Marsala, possibly on a grilled sirloin. If you love mushrooms in wine, this one is worthy of a shot at your dinner table. Mangia! Bizarrely enough, I’ve only ever eaten Chicken Marsala at restaurants and I don’t think I even tried it until I was like…15? I think that means it’s time for me to actually make this. Marcus would be beside himself with joy. I’ve had marsala sauce on a grilled sirloin, and it was FAB-U-LOUS! Don’t feel pigeon-holed by chicken. It’s great on both! Jeanne….what a beautiful dish! I love America’s Test Kitchens….their recipes are always right on! But I appreciate, also, your Final Thoughts….because I trust how you personally wanted to tweak this for the next time. I can’t wait to try this beautiful plate of YUM! Thanks, Anne. I love ATK, too, and I usually trust their recipes as written 100%. But the sweet marsala wine in this one just didn’t sit right with us. It was way too sweet. When I try it with the dry marsala, I’ll post an update. If you try if first, let me know how it turns out! 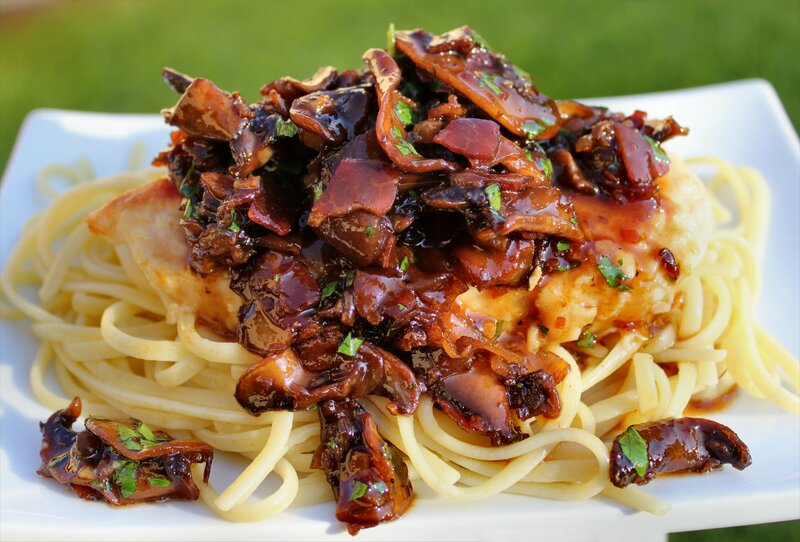 I’ve spoken to several people who said you should always make it with sweet marsala, but the little Italian man in the liquor store said “sweet is for desserts, dry is for savory” when I asked about Chicken Marsala. I haven’t given it a try yet, but when I do I’ll be sure to update the post and let you know how it turned out. I’d love to master that recipe so I can make it at home more often. I made this recipe but followed the one in the America’s Test Kitchen “Make Ahead” cookbook, only I served it right away. I followed the recommendation to use sweet Marsala and I would recommend you do the same and respectfully ignore the instructions above to use dry wine. Unless you don’t want any hint of sweetness to your marsala (which is unusual) you should use the sweet version. If you follow the recipe and add lemon juice at the end, it cuts the sweet PLENTY. I even added about a tablespoon of sugar because after adding the butter and lemon juice it was not at all sweet. It’s a great recipe as written. They have a show on PBS and painsteakingly test every recipe (hence “test kitchen”). Follow the real recipe first & adjust afterward if necessary. Correction: painstakingly — I must really be hungry! I began learning to cook just three years ago, and approached the ATK recipe w/ the bemused expectation of a result similar to the floury, cloying, perfunctory efforts of the red-sauce joints I used to frequent. (Once my purse allowed for better establishments, I plumped for things like strozzapreti and braciole instead.) But this knocked my socks off–tangy, savory, nuanced, toothsome. In the dry-marsala version. When I did it using sweet marsala (which drew a puzzled, pitying look from the young wine-store clerk who sold it to me, maybe reminiscent of Nanabread’s own guide), the result, though still very presentable, was, well, kind of glutinous. The reduction of dry marsala to “a syrupy texture” renders it a glaze; the reduction of sweet marsala renders it a light adhesive. But I left the crisped pancetta in and have no regrets. Thank you Nanabread!